Romance and Remorse: Verdi's 'La Traviata' Verdi's romantic hit got a tepid reception at its first performance, in 1853, but it's now one of the most popular operas of all time — and has even starred in a couple of Hollywood blockbusters. After Violetta leaves Alfredo in Act Two, Giorgio Germont comforts his son in one of opera's most purely beautiful baritone arias, "Di Provenza il mar" — "The Sea of Provence." Zeljko Lucic sang it at the Vienna State Opera. Violetta winds up the first act with "Sempre libera" — "Always free" — an aria revelling in the freedom of her carefree lifestyle. And she sticks with that sentiment even while Alfredo is serenading her. Krassimira Stoyanova sang Violetta in the Vienna production. If you spend much time reading about opera, you've probably seen comparisons between operas and movies and those are easy comparisons to make, as the two genres share any number of similarities. In 19th-century Europe, operas were a popular form of large-scale, mass-market entertainment. They featured compelling drama, dazzling effects, stirring music and superstar performers — just like movies do today. So it's not surprising that today we often see operas in the movies. Remember Cher attending La Boheme in Moonstruck, and Richard Gere taking Julia Roberts to La Traviata in Pretty Woman? There are plenty more examples, both among recent films and in cinematic classics. One of those classics is the 1945 Oscar-winner The Lost Weekend, directed by Billy Wilder and starring Ray Milland as an alcoholic writer. 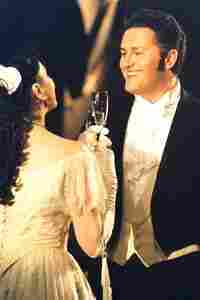 Milland's character, Don Birnam, is gamely trying to stay on the wagon, when he attends the opera with his lady friend. Unfortunately, they pick the wrong opera for a recovering alcoholic; it's a lavish production of Giuseppe Verdi's La Traviata, which begins with one of the great drinking scenes of all time. When Birnam sees this scene, his booze-driven imagination turns the performers on stage into dancing bottles and animated champagne glasses. Before long he's off to retrieve his coat — and with it his flask of rye whiskey. Ultimately, the film portrays Birnam as a tragic victim of his own lifestyle, and in that he's a bit like the main character in La Traviata, Violetta Valery. And that's not the only similarity between the movie and the opera. When it was released, The Lost Weekend was noted for its disturbingly raw portrayal of people in their most desperate moments — at a time when movies were a largely escapist form of entertainment. La Traviata was viewed the same way at its premiere in 1853. Verdi's masterpiece lacks many of the elements we often associate with blockbuster operas. It has no world-shaping political confrontations, no exotic historical settings and no eye-catching special effects — just believable characters whose own passions bring them to a sad end. World of Opera host Lisa Simeone presents La Traviata in a production from the Vienna State Opera, starring soprano Krassimira Stoyanova as Violetta and tenor Piotr Beczala as Alfredo. ACT ONE: The action begins at a party in Violetta Valery's Paris home. The setting and music are lavish, but the action is simple. Violetta is introduced to a young man named Alfredo Germont. He's been watching her from afar, and he's fallen madly in love with her. When the rest of the guests go off to dance, Violetta stays behind. Alfredo approaches her, and declares his love. The young man seems quite sincere in his feelings, unlike Violetta's current protector, the Baron Douphol. But Violetta enjoys her present lifestyle — unlimited pleasure with no commitment. She's not ready to give it all up just for love, and says so in her brilliant aria "Sempre libera." Alfredo is disappointed and leaves, but he hasn't given up hope. After he's gone, Violetta hears him singing under her balcony. ACT TWO: It's two months later, and things have changed. Violetta did give up her licentious ways for Alfredo, and the two are now living together in a small country house outside Paris. They're definitely not enjoying the sort of the lavish life Violetta led as a courtesan in Paris. Without a wealthy benefactor, she has sold many of her possessions just to pay the rent. When Alfredo discovers this he's humiliated by his inability to support her, and he leaves for Paris to raise some money. Once he has gone, Violetta's maid announces an unexpected guest. It's Giorgio Germont, Alfredo's father. He appeals to Violetta to leave Alfredo. Germont says his son's involvement with a courtesan has been bad for his family's reputation — even his young daughter's marriage is in jeopardy. The scene is one of Verdi's finest. At first, the music emphasizes Germont's coldness, the cruel superiority of his attitude and Violetta's indignant response. Why would a woman with Violetta's strength and independence even consider his request? Yet, as Germont's admiration for Violetta increases, his arguments soften. Finally, Germont's appeal is given in music so pure and moving that somehow, Violetta's ultimate resignation rings true. She agrees to leave Alfredo, despite the happiness they've shared. When Alfredo returns from Paris, Violetta can barely face him. Alone, she writes him a letter, gives it to her servant Giuseppe to deliver to Alfredo, and leaves for the city. When Alfredo finds her gone he falls into his father's arms, heartbroken. Germont comforts him with one of Verdi's greatest baritone arias, "Di Provenza il mar." Then, when Alfredo discovers a note from Flora, inviting Violetta to a party in Paris, he assumes that she's left him to go back to the high life. Heartbroken and furious, Alfredo defies his father and rushes off to find her. The next scene takes place at Flora's party. Alfredo is there, and so is Violetta. She's gone back to Baron Douphol. 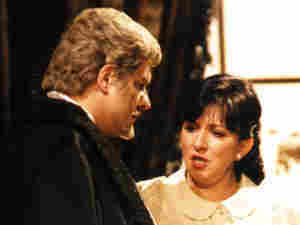 Alfredo has had too much to drink, and confronts Violetta. He takes the money he's won gambling and throws it at her feet, calling it "payment for her services." Violetta, who still loves him, collapses in humiliation and grief. As the act ends, Alfredo's father arrives and condemns his son's crass behavior. Alfredo is remorseful, but the damage is done. ACT THREE: A month has passed, and Violetta is gravely ill with consumption. She's lying in bed attended by her maid, Annina. A doctor has been called but as he leaves, he tells Annina that Violetta could die at any time. They keep this news from Violetta, but she senses the truth. Recently, she received a letter from Germont, and now she reads it aloud. It says that Alfredo wounded Baron Douphol in a duel over Violetta, and was forced to leave the country. Since then, Alfredo has been told about Violetta's illness and is hurrying to return. Now, it seems, he won't make it in time. There's a religious celebration outside, beyond the closed shutters — but inside there's little light, and little hope. In Violetta's final moments, Alfredo returns. They remember their brief happiness in the country, and for a moment Violetta seems to gain strength. She tries to get up, but it's too much for her. She urges Alfredo to find another, more innocent lover. As Alfredo weeps at her side, Violetta dies.